This name uses Spanish naming customs: the first or paternal family name is Martínez and the second or maternal family name is García. Luis Enrique Martínez García (Spanish pronunciation: [lwis enˈrike]; born 8 May 1970), known as Luis Enrique, is a Spanish former professional footballer, and is the manager of the Spanish national team. Luis Enrique was born in Gijón, Asturias, and began his career with local Sporting de Gijón, where he gained the nickname Lucho after Luis Flores, a Mexican forward in the team. He then spent most of his playing days with the two biggest Spanish clubs: first Real Madrid for five seasons and, in 1996, after seeing out his contract and notably scoring in a 5–0 home win against FC Barcelona in January 1995, stating later he "rarely felt appreciated by the Real Madrid supporters and didn't have good memories there", he moved to precisely the fierce rivals at the Camp Nou on a free transfer. The Catalans' supporters were at first hesitant about their new acquisition, but he soon won the hearts of the cules, staying eight years, eventually becoming team captain and scoring several times in El Clásico against his former employers; notably, he passionately celebrated at the Santiago Bernabéu, where he grabbed his jersey after a 25-yard strike that beat the opposing goalkeeper. Luis Enrique netted 46 La Liga goals in his first three seasons with Barcelona, with the side finishing runner-up in 1996–97 and subsequently winning back-to-back domestic championship accolades. Furthermore, he was named Spanish Player of the Year by El País in the following campaign. He also scored the opening goal in the 1997 UEFA Super Cup, a 3–1 aggregate triumph against Borussia Dortmund. During his final years in Barcelona, Luis Enrique was often injured, and did not want to renew his contract. He had been offered a deal by his first club Sporting, which he, however, declined, stating that "he wouldn't be able to reach the level he demanded of himself" and that "he wouldn't be doing Sporting much of a favour by going there." His concerns about his level and fitness made him retire on 10 August 2004 at the age of 34, and he finished his professional career with league totals of 400 games and 102 goals, being named by Pelé as one of the top 125 greatest living footballers in March. Luis Enrique played for Spain in three FIFA World Cups: 1994, 1998 and 2002 (as well as UEFA Euro 1996), and scored 12 goals while gaining 62 caps. He was also a member of the gold-winning squad at the 1992 Summer Olympics in Barcelona, and made his debut for the main side on 17 April 1991, featuring for 22 minutes in a 0–2 friendly loss to Romania in Cáceres. In the 1994 World Cup, held in the United States, Luis Enrique scored his first international goal, in the round-of-16 3–0 win over Switzerland in Washington, D.C. In the 1–2 quarter-final defeat against Italy at Foxboro Stadium, Mauro Tassotti's elbow made contact with his face to bloody effect, the action being of such impact that he reportedly lost a pint of blood as a result, but during the match the incident went unpunished – Tassotti was banned for eight games afterwards, and never played internationally again; when Spain met Italy at Euro 2008 on 22 June, to battle for a place in the semi-finals, Luis Enrique reportedly called for the team to "take revenge" on Italy for the 1994 World Cup incident. Tassotti, an assistant coach with A.C. Milan at the time, told the newspaper Marca that he was tired of always being reminded of this incident, and that he had never intended to hurt the Spaniard. At the 1998 World Cup, Luis Enrique played a major role in a 6–1 routing of Bulgaria in the last game of the group, scoring and assisting once and also winning a penalty, but the Spaniards were eliminated nonetheless. On 5 June of the following year he netted a hat-trick, in a 9–0 win in Villarreal over San Marino for the Euro 2000 qualifiers. On 23 June 2002, Luis Enrique retired from international football, in order to give the younger players more playing time and focus only on his club. Having occupied several different positions, Luis Enrique was most noted for his exceptional versatility and consistency. He was capable of playing anywhere in midfield or along the front line, and was fielded in all positions on the pitch throughout his career, except those of central defender and goalkeeper. A strong, courageous, energetic and hard-working team player, with good technical skills, flair and notable stamina, his usual position was as an attacking midfielder in the centre of the pitch, due to his ability to link-up the forwards and the midfield, or as a right winger, but he was capable of playing anywhere along the right flank, and was often deployed as an attacking full back or wing-back, or even as a left winger on occasion. Due to his keen eye for goal and ability to make attacking runs into the box, Luis Enrique frequently played as a forward, either in a withdrawn role as a second striker behind the team's main goalscorer, or even as an out-and-out striker or centre forward – he was also used in deeper midfield roles. In addition to his playing abilities, he also stood out for his commitment, temperament, determination and leadership. On 26 May 2008, Luis Enrique returned to Barcelona, taking over the reins of the B-team, renamed Barcelona Atlètic for that season. As he succeeded long-time Barcelona teammate Pep Guardiola, he stated: "I have come home", and "I finished playing here and now I will start coaching here. "; in his second season he found success, helping the club return to Segunda División after an absence of 11 years. In mid-March 2011, Luis Enrique announced he would leave Barcelona B at the end of the campaign, despite still having two years left on his contract. He led the side to the playoffs, but they were ineligible for promotion. On 8 June 2011, Luis Enrique reached an agreement with Italian Serie A club A.S. Roma to become the Giallorossi's new head coach. He signed a two-year contract, being joined by a staff of four members, including Iván de la Peña who played two years for crosstown rivals S.S. Lazio, as technical collaborator. Roma was eliminated from the UEFA Europa League by ŠK Slovan Bratislava, amid great discussion of the substitution of legendary Francesco Totti for Stefano Okaka Chuka. The capital club also lost their first game in the domestic league against Cagliari Calcio, making it just the third time that it lost the opener in 18 years. Even though he still had two years remaining on his contract, Luis Enrique decided to leave Roma at the end of the season, after the club failed to qualify for any European competition. On 8 June 2013, Luis Enrique became RC Celta de Vigo's new manager, replacing former national teammate Abel Resino. He led the Galicians to the ninth position in his first and only season, highlights including a 2–0 home win against Real Madrid that ended the opposition's possibilities of winning the league title. On 16 May 2014, Luis Enrique announced that he would be leaving Celta. On 19 May 2014, it was announced that Luis Enrique would return to Barcelona as a manager, after he agreed to a three-year deal. He was recommended by sporting director Andoni Zubizarreta, his former national teammate. His first competitive match was a 3–0 home league win over Elche CF, where he handed debuts to new signings Claudio Bravo, Jérémy Mathieu and Ivan Rakitić, and gave youth products Munir El Haddadi, Rafinha and Sandro their maiden league appearances for the club, while summer signing Luis Suárez was unavailable for selection due to suspension. Luis Enrique suffered his first defeat in the competition on 25 October 2014, away against Real Madrid, and although Barcelona had a successful run in the year, his management came under scrutiny because of his tactics involving several lineup changes in consecutive games. Moreover, a quarrel with Lionel Messi and other members of the team further accentuated the team's poor form. After an away loss to Real Sociedad, there was a significant upturn in Barcelona's form as a result of Luis Enrique deciding on a settled lineup. He equaled Guardiola's record of 11 consecutive victories, while the team went on to beat Atlético Madrid and Villarreal CF convincingly in the Copa del Rey to advance to the final. In the domestic league, after eight wins in nine matches, the team returned to the top of the table after 15 weeks. On 21 April 2015, Luis Enrique recorded his 42nd win after 50 games in charge of Barcelona with a 2–0 victory over Paris Saint-Germain FC, the best record of any manager. He went on to lead the side to the final of the UEFA Champions League and, on 17 May, led it to its 23rd national championship with one match to spare following a 1–0 win at the Vicente Calderón Stadium against Atlético Madrid. On 6 June, having earlier won the domestic cup against Athletic Bilbao by the same score, Barcelona sealed a treble with a 3–1 win over Juventus F.C. in the Champions League Final in Berlin, and three days later he signed a new contract until 2017. On 11 August 2015, Barcelona won the UEFA Super Cup after a 5–4 win against Sevilla FC. On 2 December, against CF Villanovense for the Spanish Cup's fourth round, Luis Enrique decided against bringing on a new player following Mathieu's injury with 12 minutes to go even though two replacements could still be made, as the score was at 6–1 at that time and the manager said he did not want to risk further setbacks. In his first two seasons, Luis Enrique rotated his goalkeepers, with Bravo playing league games and Marc-André ter Stegen playing cup and European matches. Both players, however, expressed opposition to this policy. A second double was achieved on 22 May 2016, following a 2–0 Spanish Cup win over Sevilla FC after extra time in which the team played more than 50 minutes with one player less, following the dismissal of Javier Mascherano. On 1 March 2017, Luis Enrique announced that he would not continue as team manager after 30 June on expiration of his contract. Luis Enrique was named coach of the Spanish national team on 9 July 2018, replacing former club and country teammate Fernando Hierro. His first match in charge occurred on 8 September, and he led the side to a 2–1 win against England for the UEFA Nations League at Wembley Stadium. Luis Enrique was sponsored by sportswear company Nike, and appeared in commercials for the brand. In a global advertising campaign in the run-up to the 2002 World Cup in South Korea and Japan, he starred in a "Secret Tournament" commercial (branded "Scorpion KO") directed by Terry Gilliam, appearing alongside footballers such as Luís Figo, Thierry Henry, Hidetoshi Nakata, Roberto Carlos, Ronaldinho, Ronaldo and Totti, with former player Eric Cantona the tournament "referee". After retiring from football, Luis Enrique lived for a while in Australia to practice surfing. He took part in the 2005 edition of the New York City Marathon, finished the Amsterdam Marathon in 2006, the Firenze Marathon in 2007 and the Marathon des Sables in 2008, while also entering and finishing Frankfurt Ironman in 2007. He was due to take part in the Klagenfurt Ironman competition in July 2008, but eventually declined due to his engagement as manager of Barcelona B. ^ "Aires de funeral en Asturias" [Funeral march sounds in Asturias]. Mundo Deportivo (in Spanish). 3 June 1991. Retrieved 29 June 2017. ^ a b Mitten, Andy (6 October 2013). "Luis Enrique: 'We think Messi is normal. I can't understand how a player got to that level'". FourFourTwo. Retrieved 7 June 2015. ^ "Nando compra su carta de libertad para poder fichar por el Madrid" [Nando buys out his contract in order to sign with Madrid]. El País (in Spanish). 9 July 1992. Retrieved 21 May 2015. ^ a b Lowe, Sid (23 October 2014). "Barca manager Luis Enrique doesn't have fond memories of Real Madrid". ESPN FC. Retrieved 28 February 2015. ^ "Luis Enrique ficha por el Barça por cinco temporadas" [Luis Enrique signs for Barça for five seasons]. El País (in Spanish). 28 May 1996. Retrieved 20 May 2014. ^ "Un gol con sabor a venganza" [Revenge-flavoured goal]. El País (in Spanish). 2 November 1997. Retrieved 20 May 2014. ^ "La cincuentena de Luis Enrique" [Luis Enrique's fifty]. El País (in Spanish). 9 October 1997. Retrieved 20 May 2014. ^ "Luis Enrique, 'pichichi' con 11 goles" [Luis Enrique, 'pichichi' with 11 goals]. El País (in Spanish). 21 December 1997. Retrieved 20 May 2014. ^ a b "Spain – Footballer of the Year". RSSSF. Retrieved 21 May 2015. ^ a b "1997: Barça in command". UEFA. Retrieved 7 June 2015. ^ a b "Luis Enrique bows out". BBC Sport. 10 August 2004. Retrieved 17 August 2009. ^ a b "Pele's list of the greatest". BBC Sport. 4 March 2004. Retrieved 17 August 2009. ^ "De nuevo vencidos y sin gloria" [Again beaten hopelessly]. Mundo Deportivo (in Spanish). 18 April 1991. Retrieved 18 February 2014. ^ "New Barcelona boss Luis Enrique scores for Spain at 1994 World Cup". BBC Sport. 20 May 2014. Retrieved 20 May 2014. ^ "Luis Enrique full of respect". BBC Sport. 20 June 2002. Retrieved 17 August 2009. ^ "Date set for Hendry decision". BBC Sport. 3 April 2001. Retrieved 17 August 2009. ^ "Luis Enrique: "Espero que Villa me vengue ante Italia"" [Luis Enrique: "I hope Villa avenges me against Italy"]. Marca (in Spanish). 18 June 2008. Retrieved 10 September 2008. ^ "Spain beats Bulgaria 6–1 but fails to qualify". Sports Illustrated. 19 September 1998. Retrieved 20 May 2014. ^ "Líderes con otro 9–0" [Leaders with another 9–0]. Mundo Deportivo (in Spanish). 6 June 1999. Retrieved 21 May 2014. ^ "Luis Enrique calls time". BBC Sport. 23 June 2002. Retrieved 2 March 2015. ^ "Antic: "Estoy seguro de que mi sistema es bueno"" [Antic: "I'm sure my system is good"]. El País (in Spanish). 17 August 1991. Retrieved 4 July 2013. ^ "El Madrid desborda a un lastimoso Sevilla" [Madrid tear pityful Sevilla apart]. El País (in Spanish). 29 September 1991. Retrieved 4 July 2013. ^ "El Madrid intentará golear al Logroñés en el Bernabéu" [Madrid will try to rout Logroñés at the Bernabéu]. El País (in Spanish). 14 March 1993. Retrieved 4 July 2013. ^ "El jugador más versátil" [The most versatile player]. Mundo Deportivo (in Spanish). 12 August 1997. Retrieved 24 April 2018. ^ "Van Gaal, sin dudas" [Van Gaal, no doubts]. Mundo Deportivo (in Spanish). 25 September 1998. Retrieved 24 April 2018. ^ "Adriano: el "relevo" de Luis Enrique" [Adriano: Luis Enrique's "replacement"] (in Spanish). FC Barcelona. 22 July 2010. Retrieved 4 July 2013. ^ Ordine, Franco. "LUIS ENRIQUE Martinez" (in Italian). Treccani: Enciclopedia dello Sport (2002). Retrieved 13 January 2017. ^ "Le stelle di Francia 98: da Luis Enrique a Hadij" [The stars of France 98: from Luis Enrique to Hadij] (in Italian). Solo Calcio. Retrieved 13 January 2017. ^ "Luis Enrique Martínez". FC Barcelona. Retrieved 13 January 2017. ^ "Coach – Luis Enrique". Football España. Retrieved 6 February 2017. ^ a b "Luis Enrique, nuevo entrenador del Barcelona B" [Luis Enrique, new Barcelona B coach]. El País (in Spanish). 26 May 2008. Retrieved 14 November 2012. ^ "Luis Enrique se va a final de temporada" [Luis Enrique leaves at the end of season] (in Spanish). FC Barcelona. 15 March 2011. Retrieved 27 April 2011. ^ "Eusebio quiere igualar al filial de Luis Enrique" [Eusebio wants to match Luis Enrique's reserves]. Marca (in Spanish). 3 June 2014. Retrieved 14 May 2016. ^ a b c "Luis Enrique ha firmato "Farò calcio spettacolo"" [Luis Enrique has signed "I will produce spectacular football"]. La Repubblica (in Italian). 8 June 2011. Retrieved 27 January 2016. ^ "Serie A – Enrique's Roma lose opener". Yahoo! Sports. 11 September 2011. Retrieved 24 September 2011. ^ "Luis Enrique's Roma experiment going up in smoke". FourFourTwo. 26 April 2012. Archived from the original on 2 May 2012. Retrieved 23 May 2012. ^ a b "Luis Enrique lascia la Roma: Per me è una sconfitta" [Luis Enrique leaves Roma: For me it's a loss]. La Presse (in Italian). 10 May 2012. Retrieved 23 May 2012. ^ a b "Luis Enrique appointed Celta boss". ESPN FC. 8 June 2013. Retrieved 27 January 2016. ^ "Luis Enrique: "Hemos aprovechado sus errores"" [Luis Enrique: "We took advantage of their mistakes"]. Marca (in Spanish). 11 May 2014. Retrieved 20 May 2014. ^ a b "Luis Enrique to leave Celta Vigo amid rumours he is set for Barcelona". The Guardian. London. 16 May 2014. Archived from the original on 2 August 2014. ^ a b "Barcelona appoint Luis Enrique as first-team coach". BBC Sport. 19 May 2014. Retrieved 19 May 2014. ^ Cryer, Andy (24 August 2014). "Barcelona 3–0 Elche". BBC Sport. Retrieved 25 August 2014. ^ "Lionel Messi, Luis Enrique argued in Barcelona training, says Mathieu". ESPN FC. 29 January 2015. Retrieved 28 February 2015. ^ "Barcelona: Are we seeing the reawakening of Pep Guardiola's side?". Bleacher Report. 26 February 2015. Retrieved 8 March 2015. ^ "FC Barcelona v Rayo Vallecano: Storming to the top of the table! (6–1)". FC Barcelona. 8 March 2015. Retrieved 8 March 2015. ^ "Barcelona manager Luis Enrique targets Champions League title". Sky Sports. 22 April 2015. Retrieved 24 April 2015. ^ "Lionel Messi hands Barcelona 23rd La Liga title". The Daily Telegraph. 17 May 2015. Retrieved 19 May 2015. ^ "Barcelona win La Liga: 10 key factors behind their revival". BBC Sport. 17 May 2015. Retrieved 19 May 2015. ^ "Barcelona: Coach Luis Enrique extends contract to 2017". BBC Sport. 9 June 2015. Retrieved 9 June 2015. ^ "Barcelona 5–4 Sevilla". BBC Sport. 12 August 2015. Retrieved 12 August 2015. ^ ""¿Con 10? No quería arriesgar a jugadores importantes en frío"" ["With 10? I did not want to risk important players without warmup"]. Diario AS (in Spanish). 2 December 2015. Retrieved 9 December 2015. ^ "Claudio Bravo y su incomodidad con la rotación" [Claudio Bravo and his discomfort with rotation] (in Spanish). Goal. 2 November 2015. Retrieved 26 March 2016. ^ "Ter Stegen drops Barcelona exit hint". FourFourTwo. 25 March 2016. Retrieved 26 March 2016. ^ "Messi sirve el doblete" [Messi hands out double]. Marca (in Spanish). 22 May 2016. Retrieved 25 May 2016. ^ "Luis Enrique announces he will leave Barcelona at end of season". The Guardian. 1 March 2017. Retrieved 15 March 2017. ^ "Spanish FA: Luis Enrique is the new coach of Spain". Marca. 9 July 2018. Retrieved 9 July 2018. ^ Taylor, Daniel (8 September 2018). "Rodrigo consigns England to defeat by Spain in first post-World Cup match". The Guardian. Retrieved 9 September 2018. ^ "A lighter shoe, cooler kits, a faster ball, a Secret Tournament – every touch counts". Nike. Archived from the original on 2 June 2002. Retrieved 21 July 2012. ^ "Luis Enrique correrá el Maratón de las Arenas" [Luis Enrique to run Marathon des Sables]. Marca (in Spanish). 12 February 2008. Retrieved 10 September 2008. ^ "Luis Enrique". Footballdatabase. Retrieved 21 May 2015. ^ "Luis Enrique Martínez García – Goals in International Matches". RSSSF. Retrieved 1 September 2010. ^ "Luis Enrique". European Football. Retrieved 6 June 2015. ^ "Luis Enrique competition coaching record". UEFA. ^ "Luis Enrique: Luis Enrique Martínez García: Matches: 2008–09". BDFutbol. Retrieved 27 January 2016. "Luis Enrique: Luis Enrique Martínez García: Matches: 2009–10". BDFutbol. Retrieved 27 January 2016. "Luis Enrique: Luis Enrique Martínez García: Matches: 2010–11". BDFutbol. Retrieved 27 January 2016. ^ a b "Managers: Luis Enrique". Soccerbase. Centurycomm. Retrieved 23 December 2016. 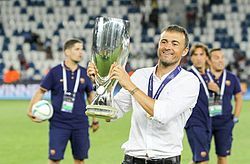 ^ "Luis Enrique: Luis Enrique Martínez García: Matches: 2013–14". BDFutbol. Retrieved 27 January 2016. ^ "Un pasillo y muchos bostezos" [Guard of honour and yawns aplenty]. Mundo Deportivo (in Spanish). 11 June 1995. Retrieved 22 May 2015. ^ "Una Copa para el consuelo" [Consolation Cup]. Mundo Deportivo (in Spanish). 27 June 1993. Retrieved 23 May 2015. ^ "El Barça se estrella contra la mala suerte" [Barça crash into bad luck]. Mundo Deportivo (in Spanish). 17 December 1993. Retrieved 23 May 2015. ^ "Adiós con sonrojo" [Embarrassing goodbye]. Mundo Deportivo (in Spanish). 16 May 1998. Retrieved 23 May 2015. ^ "Despedida a lo gran campeón" [Curtain call as great champions]. Mundo Deportivo (in Spanish). 14 June 1999. Retrieved 23 May 2015. ^ "Barça de titanes" [Titanic Barça]. Mundo Deportivo (in Spanish). 29 June 1997. Retrieved 21 May 2015. ^ "La Copa más histórica" [The most historical Cup] (PDF). Mundo Deportivo (in Spanish). 30 April 1998. Retrieved 21 May 2015. ^ "Título con súper-susto" [Title with mega-scare]. Mundo Deportivo (in Spanish). 29 August 1996. Retrieved 21 May 2015. ^ "1996/97: Ronaldo spot on for Barça". UEFA. 14 May 1997. Archived from the original on 3 May 2010. Retrieved 21 May 2015. ^ "Supervivientes de oro" [Golden survivors]. El País (in Spanish). 25 February 2007. Retrieved 24 May 2018. ^ "El triunfo en el fútbol, broche de oro para España en Barcelona 92" [Football win, icing on the cake for Spain in Barcelona 92] (in Spanish). Dame Un Silbidito. April 2010. Retrieved 22 May 2015. ^ a b c d e f "Luis Enrique". Soccerway. Retrieved 27 January 2016. ^ "ESM XI". RSSSF. Retrieved 9 March 2016. ^ "Gala de los #PremiosLaLiga: La confirmación de un éxito rotundo" [#LaLigaAwards gala: The confirmation of a complete success] (in Spanish). Liga BBVA. 30 November 2015. Retrieved 9 March 2016. ^ "Barcelona's Luis Enrique named FIFA World Coach of the Year". ESPN FC. 11 January 2016. Retrieved 9 March 2016. ^ "The world's best club coach 2015". International Federation of Football History & Statistics. 4 January 2016. Retrieved 9 March 2016. ^ "World Soccer Awards – previous winners". World Soccer. 14 December 2012. Retrieved 13 February 2016. Wikimedia Commons has media related to Luis Enrique.